← We Have Movement in the Right Ankle! In case you didn’t know that, now you do! We did not. 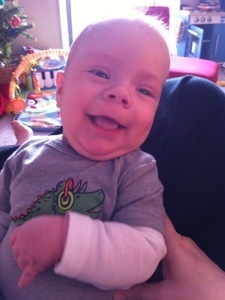 Colten has been getting his daily dose from a bottle originally opened back in November. Thankfully, his dose is small (1mL) and just preventative. Because his urine refluxes back up into his kidneys, the amoxicillin is to prevent a UTI (the urologist is giving Colten’s body time to resolve this issue. If it’s not resolved by the time he’s about four months, they will have to surgically fix it for him). I started thinking back though. I had just called Mott’s Neurology team the week before because something had seemed off with Colten but I couldn’t quite figure it out. After Christmas, he had started sleeping a LOT and even seemed to be spitting up more. There was one day where he only had three awake hours. Literally. He would get up, eat, play for a bit and go right back to bed only an hour after waking. We were seeing him take six-hour-long daytime naps, and still sleep at night. You would think we would just sit back and enjoy having a child that goes to sleep as easily as he does and stays asleep as long as he does! Instead we worried something was wrong. But we did take advantage of the infant-free time to get Christmas disassembled, toys re-arranged, and even got to enjoy some toddler-only-time with our other two sons. Colten did have a few periods where he seemed a little fussier than normal, but not terribly. He was still quite happy for most of his awake times. So I asked around and every mom told me something different. I heard it all: He’s growing… It’s a tummy virus… Maybe he’s constipated… Could be a shunt issue… But when it came down to it, he was alert when he was awake, he was growing, he was eating, smiling, filling diapers, had a soft fontanel. The neurology department said to watch him but they think he’s okay. So I pushed aside the feeling that anything was wrong. Today though, we are on day two or three (they kind of start to run together) of some dry diaper changes. There was one night where he slept all night – and not the kind of newborn “all night” that is really just from 11pm-5am, but as a mom, you’re thinking – hey, if 5-6 hours at night is considered the medical definition of sleeping through the night, I WILL TAKE IT! As time moves on, you realize that while great at the time, you just want them to really REALLY sleep all night – as in 8pm-8am. And that’s almost what Colten did. He slept from about 9pm-6am. And woke up just about dry. Sure, he wasn’t nursing all night but it still seems weird that he could go that long and have an almost dry diaper. He had nothing left in him from the last feeding of the night? That was followed by a few more dry or very light diapers. So I called urology AGAIN. Apparently now I’m “that mom” that is going to be neurotic about everything. But I do admit it to the nurses at least. I keep finding myself saying, “If this was either of my other two sons, I would not have thought much about it, but it’s Colten…” We so badly want to raise him how the other two were raised – somewhat hands-off when it came to medical stuff. We try not to get worked up about a slight fever, we avoid unnecessary medication for ear infections if they are not severe or painful, we try natural remedies, alternative treatments, natural supplements, good diets, and just overall good health to keep our systems in shape. We don’t always win at it, but we do pretty good. Colten is stirring the pot for us though. We are looking at things very differently and trying to figure this whole spina bifida and hydrocephalus thing out. Things that would be worry-free in our other boys at that same age – spitting up a bit more, sleeping a bit more, a random dry diaper… These can all be signs that something could be wrong when you’re looking at these symptoms in a child with spina bifida. I feel like there are all of these, “yeah, but…” instances. In the end, it’s just a matter of watching him for changes or signs that something is wrong. Recently, we have been going through the days questioning, feeling like something might be off but we’re unable to put our finger on it and no strong symptoms are emerging to clue us in. Something will seem wrong, like the dry diaper, and we can usually find some excuse why it’s not really wrong, it’s just a change in circumstances. So we aren’t sure if we’re finding excuses, stretching reality, missing something, or if there really is something not right for our little man. When we took him in for his shunt revision back in November, just two weeks after his shunt was first placed, we both knew something was clearly NOT right with him. But the doctors in the ER kept wavering, looking for something more concrete and not finding it at first. They were ready to send us home and I pushed a little harder – got stronger in my conviction that something in fact WAS wrong and I was not comfortable leaving. Eventually they did the ultrasound and found that, hey, what do you know?! The shunt had indeed failed. So while I am glad my “Momma’s gut” helped in that situation, I’m not nearly as confident this time around that something is actually wrong. It just feels, well, not right. This is certainly one of our take-away lessons hitting us full force. We have to learn to trust our guts and to trust the medical community. 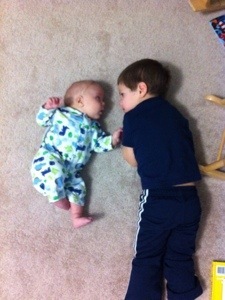 Sometimes they are at odds and that’s when we have to figure out which of us is making the best decision for Colten. For now, since he seems content and happy, continues to thrive, isn’t showing any other significant symptoms, and all the medical people we spoke with have told us he’s fine, we’ll chalk it up to our neurotic minds and over-protective guts. But don’t think for a second I haven’t started writing down every detail about his diaper changes, feedings and naps! Just in case I need to call urology a third time this week. This entry was tagged amoxicillin, medication, spina bifida. Bookmark the permalink. You’re a great momma. Keep in mind, too, that the more PT Colten does, the more tired out he will be. Even simple PT tasks tend to wipe kids out. We ran into that with Hannah a lot too. Glad to see you guys are checking every angle and keeping a close watch on the little munchkin. He’s in great hands! You are a fabulous mama…never forget you know your child better than a doctor does. I knew something was wrong with Angela and it took two years of doctors/specialists to finally get it right. I knew – in my mama’s gut – that these doctors didn’t know. Keep up the jouraling. It may be nothing, but at least you will have a record. Prayers…..
Moms always have a sense about their children and you are doing the right thing by calling and journaling. Colten is such a cutie!